Large calico bag with bottom gusset and two handles. Ideal for environmental projects as calico is a renewable resource and bags are continually re-used. This product is part of our Green Conceptz Collection which promotes environmentally friendly, and eco friendly messages. 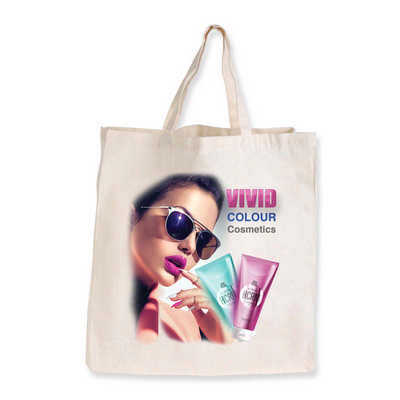 Colours - Natural Size - Bag: 390mmL x 425mmH, Handle Length: 400mmL, Side & Bottom Gussets: Approx. 120mmL Decoration Area(s) - Screen Print : Front/Back - 290 x 320mm (LxH); Nucolour 4CP Digital Transfer : Front/Black - 210 x 297mm (LxH); RBG Direct to Garment Print : Front/Back - 290 x 290mm (LxH), Submit design for acceptance & price.